The Direct Marketing Club of New York’s (DMCNY) Outlook Luncheon is always well attended by direct marketing professionals who are passionate about what they do and excited about the pace of change within the industry. But the people are just one of the reasons I’ve been involved with the DMCNY for more than 15 years; the unique learning opportunities are another. This year’s presentation from Bruce Biegel, Senior Managing Director of Winterberry Group, recapped the major events that shaped direct marketing in 2017 and the trends that will drive it through 2018. Driven by both consumer spend and business investment, Biegel reported that national marketing spend saw 2.9% growth to an estimated $301.4 billion in 2017—roughly the same as U.S. GDP growth. About $118 billion of 2017’s marketing spend was allocated to traditional channels (television, magazines, radio, etc.). That’s down by about 3% from 2016, with newspapers, magazines, and television losing out to online video advertisement. The year also experienced lower direct mail volumes, which dipped by 5.4% over the course of 2017 from 2016’s election-year spike. The other takeaway from 2017 was display advertisement spend outpacing search for the first time in history. Online marketing spend was up across all tracked channels (mobile, email, social, display, search, etc. ), but display advertisement took home the greatest share—about $41.3 billion (46%) of the $89.1 billion total spent on digital media. The fluctuating spend between traditional and digital marketing brings at least one thing into sharp focus: no matter the channel, no matter the goal, every marketing effort is dependent on relevant personalization for success. This is especially obvious as we take 2017’s momentum into 2018, proving that 1-to-1 connections mean the difference between an effective, omnichannel marketing program and noise. Integration will be key to bridging the gap between direct mail and digital channels to drive what Biegel and Winterberry Group called “Continuous Engagement”—using sophisticated data to track customer behavior, attitude, engagement, and conversion at the touchpoint level, and reaching them on multiple fronts. Biegel’s presentation stated that 68% of agencies reported clients requesting help planning omnichannel campaigns like these, while about half are making moves toward creating their own customer journey practice in 2018. For direct marketers, this means supporting the customer journey with even greater focus. For IWCO Direct, it means working with clients to leverage our broad platform to visualize, manage, and personalize the customer journey with our powerful mix of strategy, creative, and production. 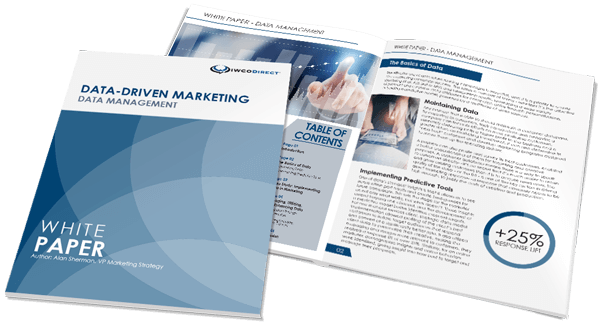 Winterberry Group’s findings for 2018 align with what we are seeing in our clients’ use of direct mail in multichannel marketing campaigns. Our clients need to create campaigns that cut through the noise using an omnichannel strategy powered in part by direct mail, which offers the highest response rates of any channel. We’re always in pursuit of true 1-to-1 marketing reach with direct mail, and the only barrier to full omnichannel integration is the combination of relevant data and personalization. Between the Olympics, midterm elections, and a strong economic outlook, 2018 is sure to be an exciting year for marketers. With all that on the horizon, we’re already looking forward to January 2019, when we’ll get our hands on Winterberry Group’s next report on the state of data-driven marketing.